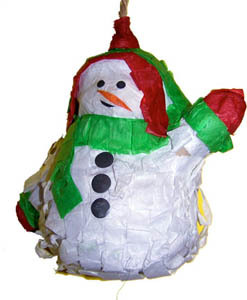 Polly Wanna "Snowman" Pinata bird toy is a treat anytime ... but would certainly be a fun toy to keep your bird entertained during the Christmas holidays. Suggested for small birds. This candy cane comes with its own treats ... the nutritious kind that any bird will love. Watch your bird go to town as he discovers the special surprise inside. Chewable, interactive or foraging toys are necessary for a bird's well-being. This creative line of high quality toys offer play activity to keep your bird busy and entertained in a cage or on a playstand. 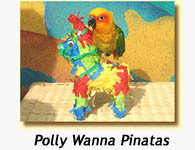 Affordably priced so that you can offer your bird a selection of toys that provide stimulation and a welcome change.